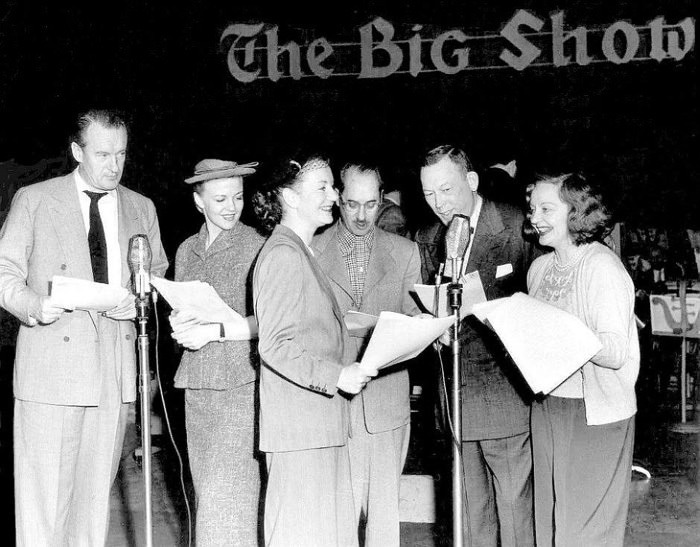 By the early 1950's, sponsors were beginning to abandon radio for television, but nothing on the small screen had the class and sophistication of NBC's The Big Show. 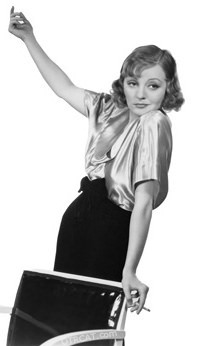 Although Mistress of Ceremonies, Tallulah Bankhead and her guests from the world of entertainment were definitely "upper crust", Miss Bankhead's friendly and accessible manner meant that the program was as entertaining in the parlor as it was in the garage. 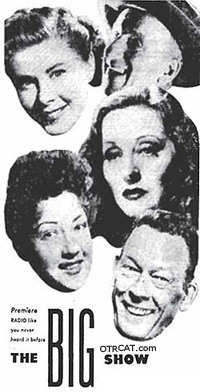 "Fred Allen Phil Silvers Margaret Truman"
Hosted by Tallulah Bankhead, "mistress of ceremonies," The Big Show competed against The Jack Benny Program and The Charlie McCarthy Show for the attention of Sunday night radio listeners. Money flowed like wine into this unusually large program, with some shows topping $100,000.The Big Show also competed against television, and how! The Big Show had big names – including Fred Allen, Jimmy Durante, Groucho Marx, Ethel Merman, Ethel Barrymore, Gary Cooper, Ray Bolger, Martha Raye, Frankie Laine, Ed Wynn, Bob Hope, Judy Garland and Danny Kaye, to mention a few. Text on OTRCAT.com ©2001-2014 OTRCAT INC All Rights Reserved-Reproduction is prohibited. Put on your high-flying slippers and pull your oversized armchair to the enormously roaring fire, because this is going to be an extravagant night full of huge laughs and grandiose entertainment. Please note: This disk is the same contents as Vol. 2 of the Tallulah Bankhead Collection. I came across Old Time Radio many decades after it aired. I am in my early 30s but love the Golden Era of Hollywood and am very interested in the evolution of media from the 1900s. My favourite discs are those of The Big Show with Tallulah Bankhead as well as the Fred Allen Show. It's fun to imagine how people back then would gather around their radio sets to hear shows, just how I would set up my boxy TV to watch my shows as a kid. Nowadays everything is streaming on the internet and people can watch and listen on demand. It's a different lifestyle today. I love how Old Time Radio is a historical momento and I hope people keep listening to it. I\'ve been listening to Tallulah Bankhead\'s \"The Big Show\" and I\'m surprised that I wasn\'t previously aware of it. I think it\'s wonderful. It\'s a really nice show with something for everyone. I also love how everyone sings the closing song, \"May The Good Lord Bless And Keep You.\"
The Big Show was NBC\'s attempt to attract a Sunday radio audience using Tallah Bankhead and Meredith Wilson as hosts...also a lot of guest stars...As I recall, it was an hour show about 9 pm a little past my bedtime, but occasionally i would listen...The closing song \"May the Good Lord Bless and Keep You\" had the actors singing a separate line. I have heard that it was also sung in churches for the boys entering the service. Best variety show of all time and beautifully written by Goodman Ace. He caught Tallulah\'s personality. May the Good Lord...was written by Meredith Willson specifically for the show and was covered (recorded) by many artists over the years. It was actually a 90 minute show usually aired from 6-7:30..